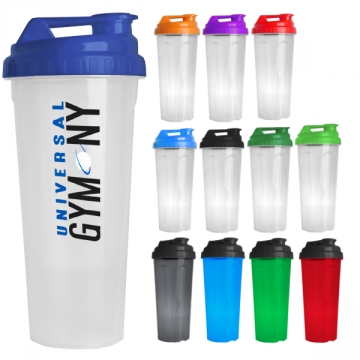 This shaker bottle has a huge opening for easy filling with powdered drink mixes. It has handy molded measurements on the side, an ergonomic gripper design, and a mixing ball to make sure your drink is fully blended. Mix and match bottle, lid, and ball colors to match your organization's branding! For the same bottle without a mixing ball, check out our Sports Drink Tumbler. Approved for Children: This product meets CPSIA and FDA testing requirements for children ages 3+. Refer to our FAQ on child-safe water bottles. Art can also be emailed to art@bulletinbrands.com. If you have pop-up blockers enabled, please email your art after placing your order. Don't worry...we'll send you a proof before we print your bags. Free samples are limited to two (2) per customer and must ship to a continental US address. Samples on items over $5 are billed at 50% off lowest price (we will email you for payment prior to shipping, if applicable). Please contact us for sample requests that must ship internationally. Request a sample now!